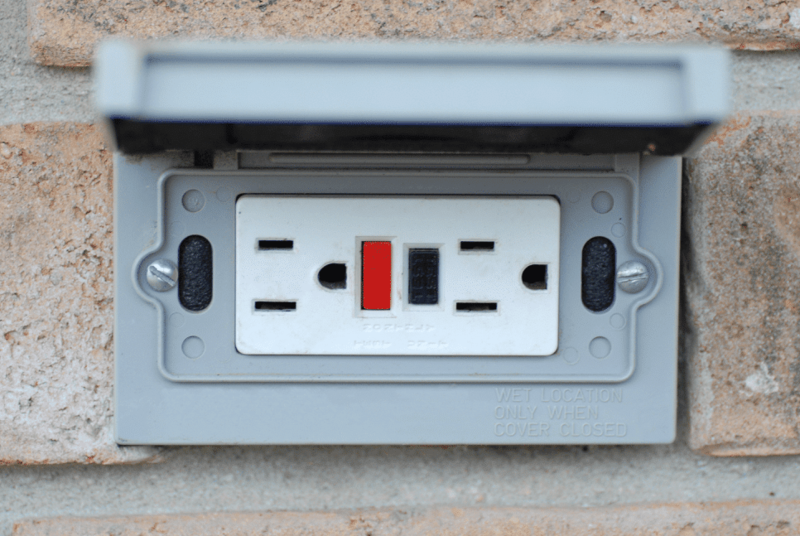 Outdoor outlets have become a common feature of modern homes, but many homeowners aren’t familiar with their benefits. Outdoor electrical products are certainly a convenience. Are you concerned with the safety aspects of plugging in your electronics outdoors? This is not a problem with GFCI outlets; a ground fault circuit interrupter cuts the power when there’s a current imbalance, such as when an electrical source is exposed to water or humidity. Running an extension cord from an indoor outlet can put your home or family in danger. An overload can occur if multiple appliances are plugged in, and if the cord passes through a confined or covered area, it can overheat. Plus, you also risk using a cord of the wrong size, type, or rating. Always plug a microwave, electric grill, or other appliance directly into a wall socket. Plug your tools or yard equipment directly into a socket on an outdoor wall. Without running an extension cord, even temporarily, you save time and energy. There is less risk of tripping over it. And plugging your equipment in near their place of use is more convenient anyway, with less stress and aggravation. Barbecues and other outdoor gatherings are much safer when outdoor outlets are properly installed. You can power an electric grill, mini fridge, stereo, and strings of lights. Think about the inconvenience if an extension cord becomes suddenly entrapped or cut if an open window or doorway suddenly closes. You won’t have power outside; not to mention the potential to start a fire and needing electrical repairs you could have avoided. When the holidays come around, you can plug holiday lights into your GFCI outdoor outlet without worrying about running extension cords to indoor outlets. This frees up your indoor circuits and reduces the fire risk during the most festive times of the year. The use of GFCI outlets is highly recommended. But even though they offer protection if electrical components and devices are directly exposed to water or moisture, you should not install an outlet near a pool or hot tub. If you entertain outdoors, it’s a good idea to install outlets near the action. This makes setting up a backyard party easier and provides instant access to sources of electricity. Using a GFCI outlet is simple. It opens the circuit automatically if an abnormal current flow to ground is detected. When the outlet stops working, you can determine the source of the problem without getting shocked, burned, or causing a fire. When the issue is resolved, you can press the reset button to get things working again. Whether you need electrical repairs or outdoor outlets installed or replaced, Express Electrical Services is the best electrician in Southern California to call, including in Los Angeles, Orange County, and Riverside County. Our team is available 24/7 and can be at your home in an emergency within 60 to 90 minutes. When you need assistance, call us or request service online and we’ll do everything in our capabilities to keep your home and family safe.